Before I was really good friends with God and began studying the bible for myself, I pictured God in a completely different way than I do now. I looked at him as a distant, rule-maker, a disciplinarian… I didn’t spend much time with Him then…I mean you know… who wants to hang out with the principle of your school right?? YIKES! But He kept drawing me in…I’d talk to someone who hung out a lot with God and was drawn to the Spirit I saw in them. After getting to know Him more through the love story He wrote to us ( some people call it the Bible hehe) I began to see God in a whole different way…. When God says DO NOT …He’s saying DO NOT hurt yourself I love you. This behavior hurts you spiritually…or hurts other people …so don’t do it sweet girl. God is literally rejoicing over you …delighting over you …right now …this minute…every minute. I love hanging out with God now…He’s my BFF, my biggest fan, I take after Him, He’s all for me…when He speaks to me I listen, I can’t wait to hear what He has to say. Cuz He LOVES ME! It’s fun to think about the picture that the scripture below paints…. He is shouting over you… He’s sooooo crazy bout ya!! LIKE WHOOOHOOOOOOOOO I LOVE THIS GIRL!!!!! She’s soooo stinkin’ AWESOME!!!!! a million smiley face emojis… Thats my girl right there!! Isn’t she pretty??? Isn’t she great??? Yep, love to hang out with God now. LOVE IT. Feeling bad about you?? Hang out a little while with your biggest fan EVER. If you’re a believer, deciding to make Jesus CEO of your life is only the beginning. “Instead, there must be a spiritual renewal of your thoughts and attitudes.” (Ephesians 4:23 NLT) You have to decide to change the way you think about things. We think ourselves into feelings. That’s why if you show me your friends I’ll show you your future. You can’t hang around with friends who are getting divorced and listen to them talk endlessly about everything that’s wrong with their marriages and feel the same way about your own marriage. Because what you think, affects how you feel. I can think myself into feeling tired, or anxious or happy or sad. Most of the time, I can trace my emotions, back to my thinking. Feelings should be thought of as indicators not dictators. When you change the way you think of things the things you think of change. If you want to change your life, start with the 7 inches between your ears. Want a better husband? Start by being his biggest cheerleader, in your thoughts and in your speech… you’ll be telling him what to think about himself in the process and he’ll start believing it and acting out of it. Your own feelings will begin to change because of what you’re thinking and saying about him. You will begin to love him more and…. he’ll begin to be more lovable. As she thinks in her heart …so is she. Do you ever find yourself doubting that God will supply all your needs? You probably believe that God can supply all of your needs but somewhere in the back of our minds we kind of doubt if He actually will. I think that doubt creeps in because our idea and God’s idea of what we need may be different. For instance, I thought I needed a bigger better house about 8 years ago. 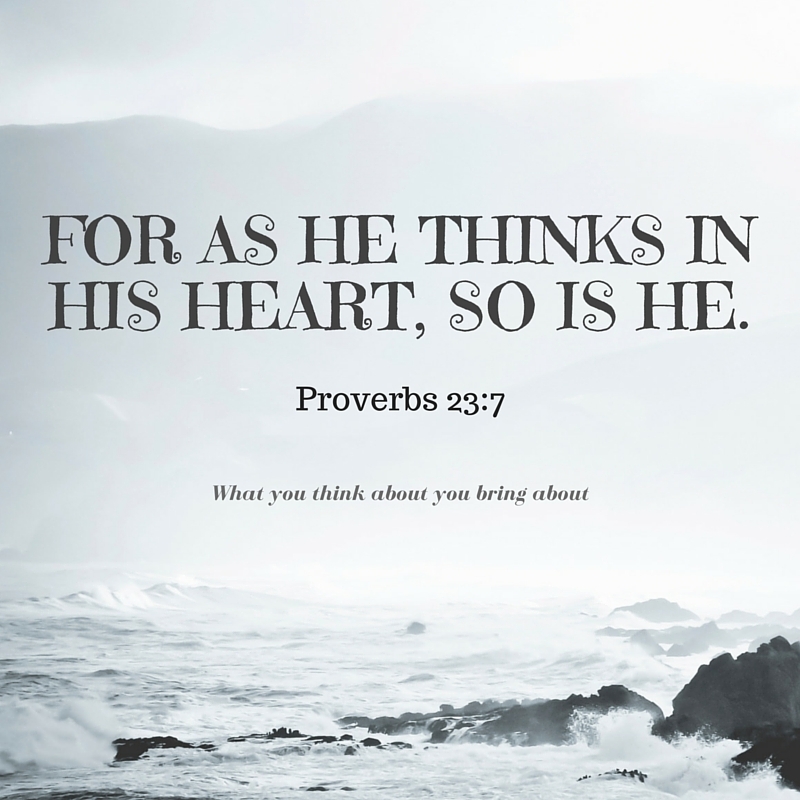 I prayed about it and began talking to my husband about it and my husband said ” No, I don’t think God’s in that honey.” So, instead of praying about whether it was actually God’s will for us to have the bigger better house, I began to pray for God to change my husband’s mind about it….I know…. this is where I’ve lost you LOL….you can’t identify with that at all. (hehe) Well, God did not change his mind….and I’m so glad He didn’t, because we would’ve bought at the very tippy top of the real estate market in 2005 and would’ve lost thousands, possibly hundreds of thousands in the subsequent crash. 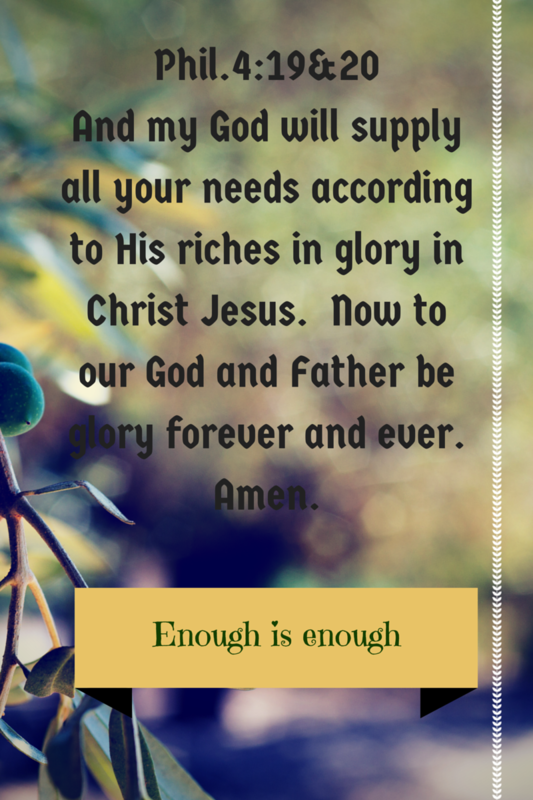 God will supply all your needs….but let me ask you is enough enough for you? My house was enough for us, it supplied all of our needs, but enough was not enough for me back then. When enough is enough for you, you become free in a way that’s hard to describe….you no longer labor and strive….but rest and work as unto the Lord. It certainly isn’t bad to want more and work to have more….but when we decide that enough is enough it’s a really peaceful place to be…if you get more that’s awesome, but it’s just the cherry on top of your sundae of contentment. Godliness with contentment is great gain….He will supply all your needs according to His riches. I had someone tell me “I don’t believe in God” and I said “well, gosh that’s a bummer, cuz you are sooo missing out” Hey! there’s no high like the Most High..and there’s no love like the love of the Almighty. You can totally reject God, but He still loves you. He’s not like people, who’s love and acceptance is typically conditional. No, He loves people who don’t love Him at all. I know this because He said it in the Bible. Like from beginning to end, the Bible is a story of a loving creator making a way back for His creation. In fact, in the Bible He says that He’ll leave the 99 (people who already love Him) to go after the 1 who is lost. He sent His one and only, very best, His son Jesus so that we could have a love relationship with Him through Jesus. You can certainly reject God’s love for you , but you will be missing out on the love of the one who is love. God made us with the free will to choose and you can exercise your free will ……because love isn’t love without the power to choose. It’s not love if you make someone love you. God so loved the world that He gave his son….His dearest ….. so whoever believed in Him would not perish but have life forever. 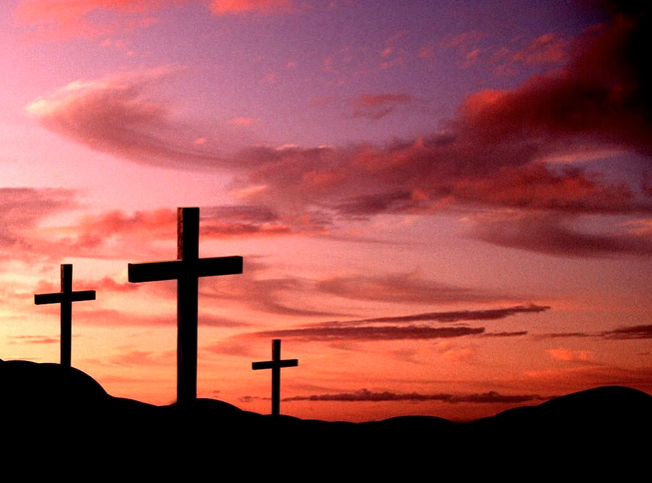 God didn’t send His son into the world to condemn the world….no….He sent Him so that the world might be saved. He loves you….as you walk around today, do your job, get your haircut, eat lunch….do it knowing you’re dearly loved by God. Have you ever paid for the person behind you in line at the drive through at Starbucks? Have you ever had someone do that for you? Imagine, you drive up to the window with your debit card out, ready to pay what you owe, only to find out that someone has already paid ??? Whaaaat???? SAAAWEET! For a coffee enthusiast such as myself, this would be a day maker. You know, the Christian faith is kind of like that. Jesus paid what we owed, and we just accept the gift. It’s one of the major differences between Christianity and other world religions. In Christianity, we are redeemed because of what Jesus did for us, He paid the price for our sin. The Bible says..we are saved by faith and not by works so that no one can boast….we can only boast in the sacrifice Christ made for us, not in how good we are. I feel that people sometimes misunderstand Christianity. Christianity is not an exclusive religion that seeks to leave people out…rather it’s the most inclusive, …whosoever- will -may- come belief system. Christianity is the most inclusive religion. The Bible says that “God is no respecter of persons”, we’re all the same to God. God’s desire is that none should perish (spend eternity separated from Him…hell). It was for freedom that Christ has set us free, not to be shackled up to “am I good enough?” doubts for the rest of our lives. But rather, God made a way for us to know that we will spend eternity with Him in Heaven….by accepting the free gift of salvation. This frees us from wondering if we’ve done enough good to outweigh the bad, have we met the obligations, rituals and other hoops that man erects. Men go to work to complicate it, but God’s plan to make a way for us to spend eternity with Him ( Heaven) is really simple. Now, don’t mistake free with cheap, that would be missing a huge part of this whole thing.. .God demonstrates His great love for His creation, by offering His one and only, dearest, son for us. Jesus’ gift to us cost Him everything, yet is completely free to us. Rejecting God’s free gift would be silly… it would be kind of like pulling up the the drive thru window and the guy says…”someone has paid for your coffee and you say ….”hmmmmm let me think about that… um, no thanks, I’ll just pay for it myself. ” That’d be crazy right?? After we accept God’s free gift, then we live out the Faith, powered up by God’s spirit, it’s a very cool thing. 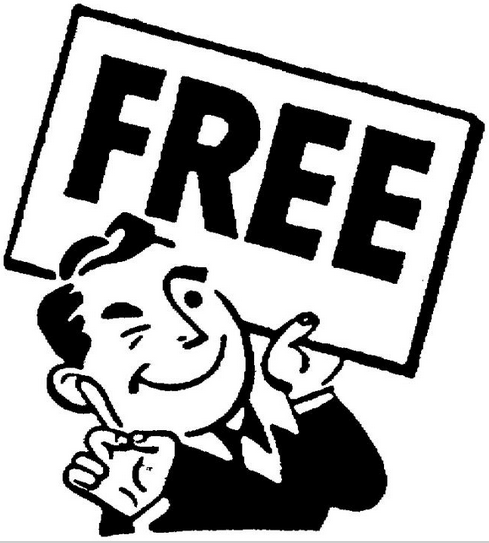 Not cheap, no, it cost Jesus everything….. but completely free to us….to ALL of us. But don’t look away, without contemplating the cross of Christ, it’s hard to get some understanding of the HUGENESS of the resurrection of Christ. Without thinking about what God was willing to pay for you, it’s hard to understand how much you’re worth to Him. Don’t look away from the Cross of Christ, don’t hide your face in your hands but rather take a good long look at it. It’s what love looks like. When I consider the crucifixion of Christ, the pain He endured, the torture He willingly subjected Himself to. I’m given the gift of perspective in 3 things. 1) I begin to see my own “sufferings” differently. 2) I begin to understand the power it took to raise Jesus from the dead. 3) I begin to understand what love looks like. When I contemplate the sufferings of Christ, I begin to ….begin to understand the miracle of His resurrection. 12 My command is this: Love each other as I have loved you. 13 Greater love has no one than this: to lay down one’s life for one’s friends. 14 You are my friends if you do what I command. And I will dwell[a] in the house of the Lord Forever. Pssst…..You’re being followed. And I’m being followed too! Yes! Followed, by the One True God. The goodness and mercy of the most high literally follow the followers of Christ. I may not feel it or see it, but I choose to know it and have come to expect it. I literally expect the goodness and mercy of the Lord to be right behind me , backing me up ….following me. Following me through the troubles, following me when I’m lonely, following me when I’ve messed up, Like the trust fall…whenever I need to fall into the arms of mercy I just let go and relax and know that goodness and mercy will never let me down. It seems to me that some Christians expect just the opposite to be following them. It seems that they live life trying to stay one step ahead of judgement. Always expecting the worst, and trying their best to stay a step ahead of problems. When I believe that goodness and mercy follow me, my pace slows, I relax in the knowledge that I’m never alone, and God “has my back”. This passage of scripture, comes from the 23rd Psalm…one of the most well-known in the whole bible and it begins with “The Lord is my Shepherd” Basically the Lord leads me, and at the same time has my back. Mercy and goodness, not harshness and judgement, are following me everywhere I go.